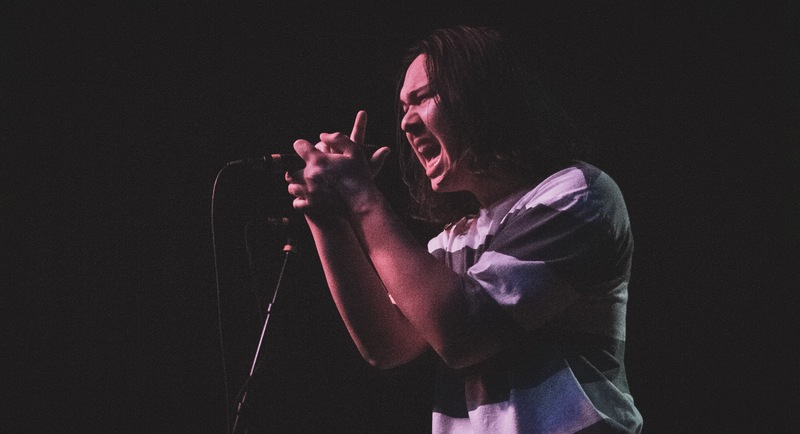 If there was one word to describe Young Culture’s show at The Prophet Bar last night, it would be: fun. There was an amped up energy in the room at all times and everyone was excited to be there. It seemed like everyone in the room knew each other or they were very eager to make new friends. Before the show even started, I had the pleasure of meeting Gabe Pietrafesa (guitarist) and Alex Magnan (lead vocals) from Young Culture. It was so awesome to see that interaction between the band and their fans as they hung outside of the venue talking to people lined up; it’s something you don’t often get to experience when seeing bigger bands. It’s really refreshing to see band members that are genuinely excited to meet people and play their music for a crowd. The night started out with the solo artist, John Pankey. He played a few of his country/Americana influenced songs as the crowd was still filtering in. The next act to take the stage was the Dallas local band, Odd Folks. They played their set of pop infused punk rock songs and got the crowd ready for Young Culture. Young Culture @ The Prophet Bar, Dallas, TX. Photo by Lauren Frederick. Feeding off of the building energy in the room, Young Culture started off their set with their most recently released single, “21 Days,” off of their new EP, (This is) Heaven. They pulled the crowd in and got people moving around and up on their feet as they played a couple older songs, such as “Party Girl” and “Biggest Mess” off of their first EP Blue. Having just released their new EP that day, the band was especially hyped up to play their new song “Breathe It In,” and getting to show off their sweet dance moves in the process. They are everything that is good about the pop punk genre and it is just a matter of time before Young Culture becomes a big name in pop punk. They flawlessly execute the pop aspect of the genre without sounding washed up – and don’t force their songs to sound one way or another, like other bands tend to do. Everything about Young Culture is genuine and it’s going to take them a long way. Even though Young Culture was the headlining act, their support for this tour, The Happy Alright, closed out the show in their hometown. It was a great way to end the night. The crowd was singing along and dancing to the beat. Every band looked like they were having the time of their lives playing music for the crowd and having so much fun jamming out with their friends on stage. Be sure to check out Young Culture’s newly released EP, (This is) Heaven. As Alex stated last night, “It’s the best thing we’ve done as a band,” and I couldn’t agree more. The Happy Alright will be joining Young Culture on the rest of their tour. Be sure to catch one of their upcoming shows. The Happy Alright @ The Prophet Bar, Dallas, TX. Photo by Lauren Frederick.